Back in the 1980's DCC (Digital Command Control) was the big break-through for operating model trains. It was revolutionary! Today, DCC is considered "standard" for most model railroaders, and they probably wonder how they got by before it was invented. Fact is; DC (the older style of operating trains) worked very well for decades. However, now that the cost of DCC has fallen and the benefits are becoming more widely appreciated, DCC is fast increasing in popularity. The big advantages of DCC include simpler wiring and the ability to control several trains at once on the same track. The initial outlay for DCC is sometimes more expensive, but DC increases in cost as the layout gets more complex. Basically whether you choose to run DC or DCC is a matter of personal preference as there are advantages and disadvantages with both systems. 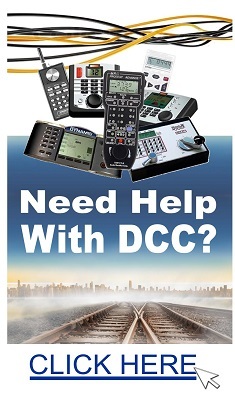 If you are starting off and don't operate DC, then starting off with DCC from scratch is the best way to learn. locomotive that listens to information in the track. as well as system features that can be expanded on. "DCC equipped", or "Factory installed decoder", or "W/DCC", or wording like that. a "Plug and Play" decoder. This is an easy installation, no soldering. without a decoder fitted, the loco would “hum” with the throttle set at "0". the manufacturer or person supplying the locomotive. Eastern Maine Model Railroad Club Inc. East Orland, Great Falls Model Railroad Club Lewiston, Maine Track N-Scale modular group in Southern Maine, Portland Terminal Modular Model Railroad Club Scarborough. Baltimore Society of Model Engineers Baltimore, Baltimore Area N-Trak Club (BANTRAK) Baltimore, Chesapeake & Allegheny Live Steamers Baltimore, Four County Society of Engineers, Frederick County Society of Model Engineers Frederick, Gaithersburg Model Railroad Society Gaithersburg, Hagerstown Model Railroad Museum Hagerstown, Maryland Central Model Railroad Club Rockville, Mason-Dixon Large Scale Railroad Society, Inc. Bel Air, Severna Park Model Railroad Club, Sykesville and Patapsco Railway, Inc. Sykesville, Triangle & Western Model RR Club Baltimore. Amherst Railway Society Inc. Warren, Bay State Society of Model Engineers Roslindale, Nashua Valley Railroad Association, Middlesex Central Railroad Club Westford, Northeast NTRAK Wilmington, North Shore Model Railroad Club Wakefield, Pepperell Siding Model RR Club Pepperell, South Shore Model Railroad Club Hingham, Tech Model Railroad Club of MIT, Waushakum Live Steamers, Worcester Model Railroaders Club. Ann Arbor Model Railroad Club, Ford Model Railroad Club Dearborn, Glancy Trains Modular Club Birmingham, Grand Rapids Model Railroad Historical Society, Gratiot Valley Railroad Club Mt. Clemens, Kalamazoo Model Railroad Historical Society Kalamazoo, Lansing Model Railroad Club Lansing, LanNTrak Lansing & Livingston County Michigan NTrak Model Railroad Club, Michigan Small Scale Live Steamers Lake Orion. Northern Michigan Railroad Club, Peninsular Modular Railroad Club (PMRC) Battle Creek - Kalamazoo, Rails On Wheels HO Modular Model Railroad Club Ann Arbor/Washtenaw County, Raisin Valley Model Railroad Club Blissfield, Riverbend Model Railroad Club Hudsonville, Society Of N-Scalers Royal Oak, South Oakland County Model Railroad Club Hazel Park, Stoney Creek Model Railroad Club Rochester, Tri county model railroad club Saginaw, West Michigan Chapter of the Train Collectors Association Grand Rapids, Western Michigan Railroad Club Grand Rapids. Crow River Junction Model Railroad Club Monticello, The G Whiz Gang The G Whiz Gang of Minnesota, Luce Line RR Club Inc. Hutchinson, Minnesota Central Model Railway Club, Minnesota Free-Mo Modellers Twin Cities, St. James Model Railroad Club, Twin City Model Railroad Museum, Railroad Club at the University of Minnesota Minneapolis, West Side Lumber Co Rochester, Winona Railroad Club Winona. Jackson Society Of Model Engineers, Mississippi Gulf Coast Model Railroad Club, NorthEast Mississippi Model Railroad Club. Big Bend Rail Road Club St Louis, Capital City Model Railroaders Jefferson City, Gulf, Midwest & Great Lakes Railroad Sedalia, Heaven's Hostlers Model railroad Club, Kearney-Holt Model Railroaders Club, Mexico Train Works Model Railroad Club Mexico, MidWest Valley Modelers St. Louis, Mississippi Valley N Scalers, NorthEast MS Model Railroad Club New Albany, St. Charles Model Railroad Club St. Charles County, Saint Louis HO Gaugers Model Railroad Club, Wabash, Frisco and Pacific Association Glencoe, Weekend"N"gineers Kansas City. Bedford Boomers Bedford - New Hampshire, Concord Model Railroad Club Concord, Connecticut Valley Model Railroad Club Lebanon, New Hampshire Garden Railway Society Club, Nutfield Valley Railroad Club Derry, New Hampshire. Central Jersey O-Scalers, Garden State Central Model Railroad Club Ashbury Park, Garden State Model Railway Club Inc North Haledon, Gateway Model RR Club, Jersey Central N-TRAK Tinton Falls, Jersey Valley Model Railroad Club, Model Engineers Railroad Club of North Jersey North Haledon, The Model Railroad Club Union, New Jersey Live Steamers Somerset County, New York Society of Model Engineers Carlstadt, Northern New Jersey N-Trak Lyndhurst, Ocean County Society Of Model Railroaders Lakewood, Packanack Train Club Wayne, Patcong Valley Society Of Model Railroaders Egg Harbor, Ramapo Valley Railroad Club Ho-Ho-Kus,, South Jersey Garden Railroad Society, South Jersey S Gaugers, Sussex County Railroad Club Hamburg, NJ. Alamogordo N-Scale Train Society Alamogordo, Mesilla Valley Model Railroad Club Las Cruces,New Mexico Rail RunNers Albuquerque, NM. Albany NY N-Trak Albany, Brooklyn N-trak Brooklyn - New York, Buffalo Model Railroad CLub Buffalo, The Catskill, Adirondack and Berkshire Railroad Albany, Central New York Large-Scale Railway Society Camillus, Central New York Model Railroad Club Syracuse, Central Operating Lines Model Railroad Club Ronkonkoma, Flower City Tinplate Trackers Rochester - New York, Genesee & Ontario Model N-Gineers Rochester - New York, Hopewell Junction Model Railroad Club - Hopewell Junction, HOTrack of the Sunrise Trails Long Island, Hudson Valley Märklin Club, Long Island Live Steamers, Long Island Model Railroad Engineers Farmingville - New York, Nassau Lionel Operating Engineers Levittown, NEB&W's Rensselaer Railroad Heritage Center, The Olde Newburgh Model RR Club, Ltd Walden - New York, Philipstown Railroad Association Cold Spring, Queens County Model Railroad Club Long Island City, RASG Modular Railroad Club Rochester, Rochester Institute of Technology Model Railroad Club Rochester, Rochester Model Railroad Club Rochester, SMRC Syracuse Model Railroad Club Syracuse, Trainmasters Of Babylon Long Island, Upstate Model Railroaders Glens Falls - New York, West Island Model Railroad Club Farmingdale, NY.